A friend of mine once quipped that Yelp is useless because every review is either really high or really low. That’s close. Yelp’s reviews are inflated and, worse, don’t answer the most important question that you need to know when making a choice from their listings. …where all the women are strong, all the men are good looking, and all the children are above average. 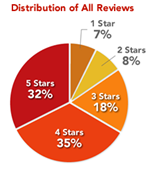 I spotted a graph of these ratings in the Yelp FAQ which I liberated for your reference at the right. On Yelp, most reviews are above average. Even the FAQ says, "3 stars and up constitute 85% of all reviews." And by the math, two-thirds of the reviews are 4 and 5 stars. Wow. I’ve seen many places that have 3 and 4 star reviews. Some are pretty awful. How bad does a place have to be to get 1 or 2 stars? 2 Meh. I’ve experienced better. 4 Yay! I’m a fan. 5 Woohoo! As good as it gets! Second, you have to ask the right question to get the right answer. Asking for a rating will not give you the right answer. For example, I would give Slumdog Millionaire 2 out of 5 stars — a decent story with poor directing and acting. But that’s not very useful if your goal is to decide whether to see that or The Spirit. Likewise, asking for a rating isn’t helpful when you’re using Yelp to find a restaurant for dinner tonight. Would you go back to this place again? If a place is worth a return visit, that’s a huge statement about how much you like it. This is a personal recommendation. Would you recommend this place to a friend? When you tell a friend to check out a place, you’re putting your reputation on the line. If your friend likes it, that reflects positively on you. If your friend hates it, then they’re not going to ask you for recommendations any more. This is a social recommendation. This rating versus recommendation thing gets to the core of Yelp’s main flaw. Yelp is a collection of ratings. It’s good at answering impractical questions such as, "show me restaurants in this neighborhood that people tend to like." Yelp is not a collection of recommendations. It does a poor job of answering the very useful question, "which restaurant in this neighborhood should I go to tonight?" If Yelp (or some other startup) built a solution to answer that question, they’d have a formula for instant success. It’s a lot like picking a doctor. You’d rather hear from a friend that his doctor is great and is taking new patients instead of sift through thousands of listings on your insurance company’s website. No wonder people hate insurance companies — such an awful user experience. Anyway, Yelp isn’t useless. It’s just that a rating is hard to digest. I’ve found some good places through Yelp. However, I’d rather get an instant recommendation instead of sifting through dozens of masturbatory reviews, each with the obligatory be-as-cool-as-you-can-be 50-by-50 pixel images. All I’m looking for is a good Italian restaurant for dinner, and Yelp’s reviews aren’t helping. Why can’t it be simpler?